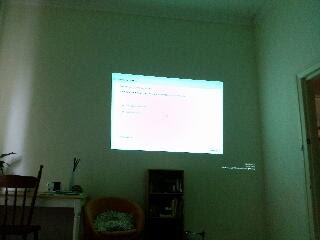 As soon as I realised we had had a projector in the house, I knew we needed to set up a home theatre. Why didn't we have one already? The first one was set up in my room, because I have a massive high ceilinged blank white wall just across from my bed. My housemates and I enjoyed a cosy night session snuggling in my bed and bean bag, munching on mixed M&Ms and Maltesers. The day after, we decided to take it outside. 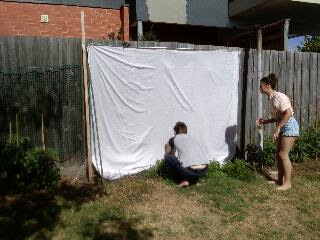 Here is my white bed sheet being nailed to the fence. 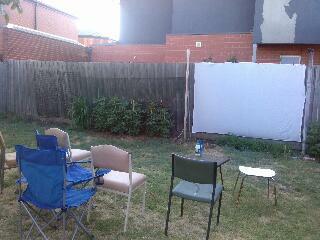 We got the spare bed mattresses out and had a fantastic post barbecue film session. Unfortunately the film of choice wasn't the best, but the experience was cool. For a more formal setting, be gone the mattresses and bring on the assorted chairs! The mattresses were comfy but not ideal for the most enjoyable movie sessions, since you either needed heaps of pillows to support your back and neck, or they ended up strained and uncomfortable. 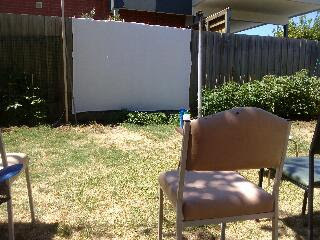 The sheet and projector has to be set up and taken in every time, but while the sun and heat lasts this Summer, the house movie sessions may well continue until the end of the month. Yuss!